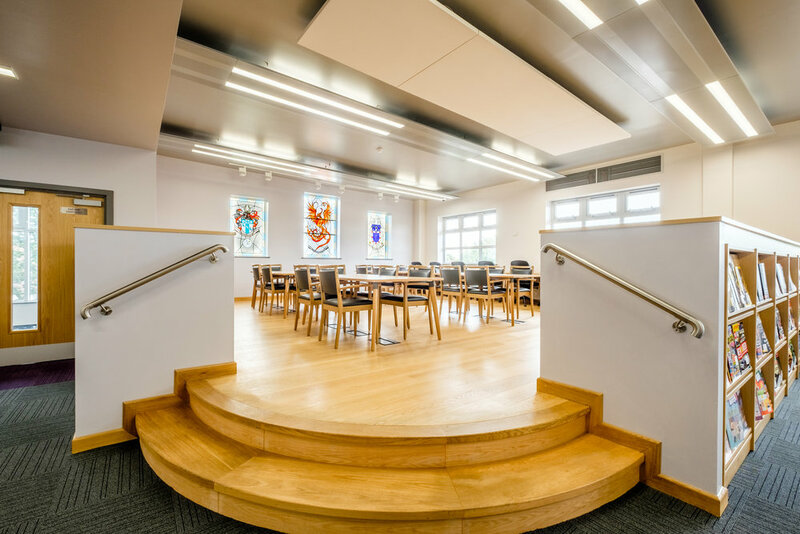 The new building at Drayton Manor High School incorporates a stunning large library and executive conference room with bespoke solid oak bookcases on the 2nd floor. The bookcases intertwine between the windows and columns and have been arranged in rows to create group breakout spaces. The design consisted of a raised area surrounded by stained glass windows for the 6th formers as they are top of the School so the younger years can be inspired to progress. The library also consists of a reception area, study desks, breakout seating, display screen for lectures and group work zones. The ground floor occupies a staff room with a fully integrated kitchenette, offices, small classrooms and special inclusion zone rooms with study booths for independent study. FFE Consulting has designed and procured full wall to wall seamless teaching walls incorporating a teacher’s station, cupboards, shelves and a slick whiteboard which slides to the side to be able to use the screen underneath for teaching purposes. During the design period FFE Consulting engaged with the project manager and end users to progress the design and specification of furniture. Before sign off we showed our client around Clerkenwell showrooms to see the various furniture we specified before the procurement process began. Specification of high-end loose furniture fit for educational purpose such as chairs, meeting tables, desks and break-out area furniture. FFE Consulting designed, specified. procured, and installed library bookcases, a fixed shelving wall unit with integrated TV screen, iPad stations, teaching walls and a reception area.